Potatoes are a staple in every household. Considered the number one vegetable in the world, it’s not surprising to learn that these are packed with nutrients that can do your body wonders. Because these are grown almost everywhere all-year round, potatoes satisfy many individuals’ need for energy. In most cases, the lack of color is an indicator of a less nutrients. This isn’t the case for potatoes, however. Potatoes also acquired a bad rep because of the starch content, leading many to believe potatoes are not good for the health. On the contrary, potatoes are packed with nutrients that can offer health benefits from improved bone health to cancer prevention. Potatoes are rich in phosphorus and calcium — two important nutrients that promote bone mineralization — that are useful in preventing bone loss. Calcium, together with potassium and magnesium are effective in decreasing low blood pressure, according to one research. Lowering blood pressure will help you avoid heart attacks and strokes. 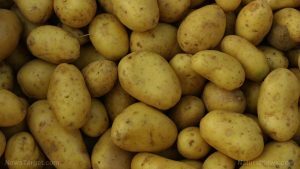 The folate found in potatoes play a role in DNA synthesis and repair. This prevents cancer cells from mutating in the DNA. At the same time, the nutrients help with the release of gastric juices that prevent constipation. The fiber content that helps bowel movement also helps scrape cholesterol off the arteries, thereby reducing the risks of heart diseases. Potatoes also have a positive effect on gout and rheumatism. They can also prevent scurvy with the abundant supply of vitamin C. Subsequently, vitamin C has antioxidant qualities that are effective in protecting you against cancer. Potatoes possess a compound called quercetin that’s proven to have anti-cancer and anti-tumor qualities. Additionally, the nutrients inside a potato can stimulate brain function and prevent the formation of kidney stones. They can help with providing relief from wounds, stomach ulcers, inflammation, skin problems, burns, and bruises. The dietary fibers found in potatoes are also useful in proper weight management. Because they increase satiety and diminish appetite, you will feel full longer and avoid unnecessary eating. By lowering your calorie intake, you will be able to maintain proper weight. Likewise, vitamin B6 effectively breaks down carbohydrates and proteins into energy to boost your metabolism. Aside from the ubiquitous mashed potatoes and french fries, you can consume potatoes in so many different ways: baked potato, tater tots, soup, casserole, salads, hash browns, and even souffles. Here are some more potato recipes you will definitely enjoy. Potatoes can prevent scurvy and keep skin healthy. Potatoes boost metabolism, which leads to better weight management. Potatoes can prevent certain types of cancer. Potatoes keeps bones strong and healthy. Potatoes keep arteries plaque-free and prevent heart diseases.